An antipasto platter is a veritable feast of cured and aged meats, cheeses, seafood, marinated veggies, olives, and bread. It would be considered the main course by some but, believe it or not, it's meant to be eaten "before the meal" because that's what antipasto means in Italian. There really is no set recipe for an antipasto platter. It's a build-to-suit appetizer course. If your family likes Gorgonzola cheese better than bocconcini, that's what you should put on your tray. If prosciutto wins out over sopressata salami, your platter should reflect that. 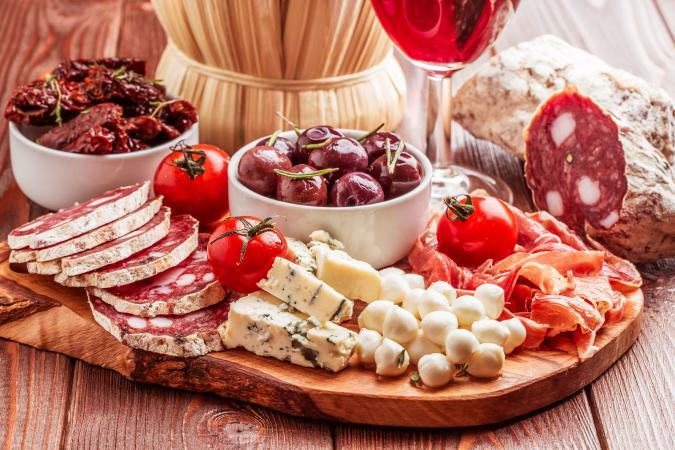 If there are rules, it's that the salumi (Italian for dry-cured meats) or other deli meats, cheeses, and bread be high-quality from an Italian deli, if possible. Except for the seafood which should be kept chilled, the food is typically served at room temperature - not cold and not hot. This recipe can be cut in half to make 6 to 8 servings. Use a large wooden cutting board, butcher block table or other display surface, to arrange your antipasti. Separate dry and wet items. For example, place meats, cheeses and bread on a cutting board with a serrated knife for the bread and cheese knives if serving whole wedges. Nestle bowls of seafood in larger bowls of ice to keep them chilled. Separate other items whose flavors you don't want to mix by placing them in small bowls artfully arranged around the other items. Serving utensils, eating utensils, small plates and napkins should be the only other things you need for guests to build their own "meal before the meal." Good beverages would be Chianti, prosecco or another Italian wine. When building your antipasto platter, remember this is truly meant to be small bites of food before the main course. Don't overwhelm your guests so they won't be able to eat the dinner you slaved over. Unless you know your company to be voracious eaters, stick with six to 10 choices of high-quality offerings. If you do have leftovers, put them to good use in an antipasto salad. Also known as an Italian chopped salad, antipasto salad contains many of the ingredients, or the ones you like best, found on an antipasto platter plus lettuce and, typically, dressed with Italian or balsamic vinaigrette and sometimes served with Italian bread croutons. In a large bowl or wooden salad bowl, combine lettuces, Italian deli meats, cheese, red onion, giardiniera, olives, red peppers, artichoke hearts, asparagus, and tomatoes. Toss to combine or arrange artfully on individual salad plates. If desired, dress the salad before serving. Season with salt and pepper. Alternatively, pass the vinaigrette at table and allow guests to dress their own salad. Pass croutons or Italian bread and a bowl of freshly grated Parmigiano-Reggiano cheese at the table. 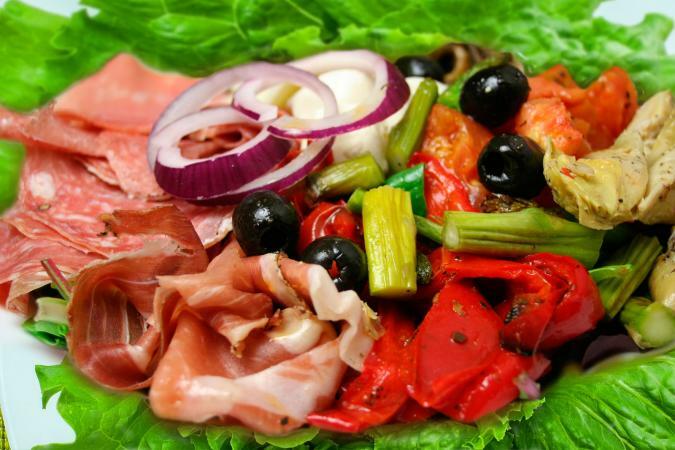 You don't have to be Italian or even like Italian food to enjoy an antipasto platter or salad. By varying the meats, cheeses, breads and vegetables, you can put an American, French, Greek, Spanish, Middle Eastern or Eastern European spin on this most delicious of food spreads. See where your palate takes you.